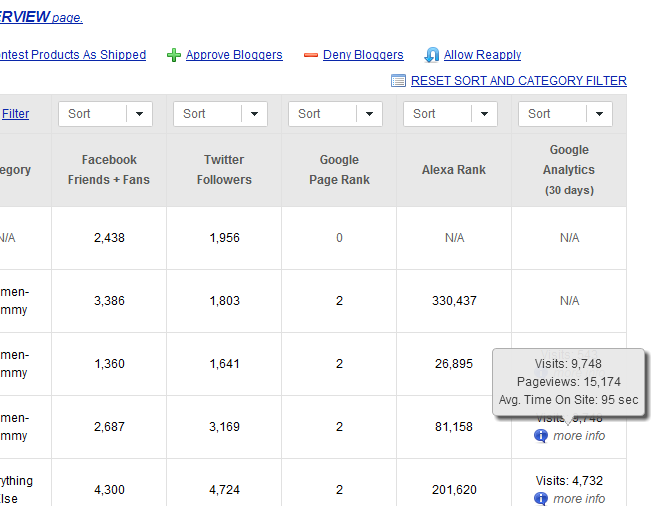 With our most recent update to Tomoson you can now integrate with Google Analytics. In the past we used the compete.com api with poor results. Now a blogger can go to their account area and use the Google API to log into their Google Analytics account. Once the blogger has verified their email and password with Google. Tomoson will pull in stats like visits, bounces, pageviews, and others. How To Update Your Tomoson Account? Log into your Tomoson account and click Account Info at the top. Scroll down and click the blue link shown below and it will take you to your Google Analytics account. Make sure you log into the Google Analytics account associated with your blog url or it won’t pull in any data. IMPORTANT: When you are applying for a new promotion make sure to update your Google Analytics information by clicking update data from Google Analytics. The Google API only allows us to grab data from the past 30 days so you will need to update your account info if you haven’t recently. If Tomoson is still not pulling in your stats from your Google Analytics account please preform the following steps. Go to https://accounts.google.com and make sure you are logged into the account associated with your Google Analytics account. If you are not please sign out and log back in with the correct account. It should be showing you the correct email address in the upper right corner of your page. If this is still not working please contact the Tomoson Support Team and they will review your issue in more detail. will be able to see you the information shown below in their stats and sorting panel. They can even sort by the number of visits on a blog.